That was a painful and totally wasted 15 minutes. I've got to stop punishing myself. Sorry man, anyting i can do to make it up to ya. I was thinking I could use an extra pair of subs to match my front pair. That may lessen the pain a bit. Not that I or anyone else is going to lose any sleep over it, but, I am trying to figure out who exactly is this guy? He seems to come out from underneath a rock every so often on these forums and if he isn't bashing something, all of sudden, he is praising some piece of equipment to high heaven which will, according to him, blow all the competition away, and it isn't even on the market yet or will be in the foreseeable future! Nobody really knows its actual specs or final price and he is talking about things the owners of the company haven't even talked about yet! He makes most of the contributors on AVS look almost reasonable! 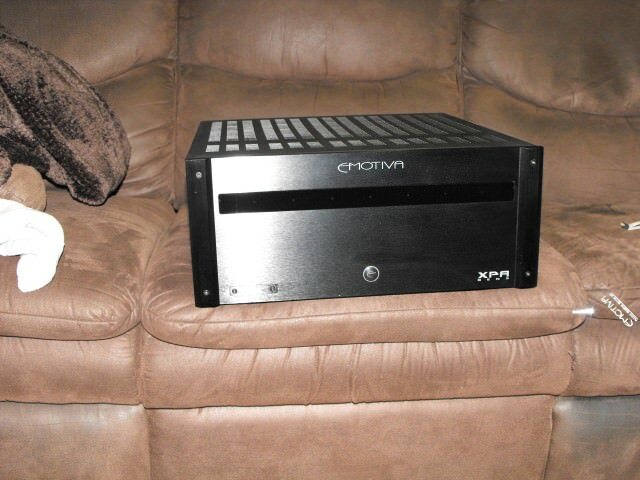 As much as I generally like the Emotiva line and I was, at one time, considering the UMC-1, despite the fact that every piece of equipment has issues from time to time, contrary to what this clown(unauthorized Emotiva spokesperson) says, those with the UMC-1 have gone for far too long so I chose to pass and go elsewhere. "Personally I'd take a relay controlled dale resistor volume ladder and a Burnsonesque output stage over any of the marketing BS you seem to prescribe to!" Yup, that's him. Incorrect usage and everything. I wonder, like, how does he poop? Not that I or anyone else is going to lose any sleep over it, but, I am trying to figure out who exactly is this guy? He seems to come out from underneath a rock every so often on these forums and if he isn't bashing something, all of sudden, he is praising some piece of equipment to high heaven which will, according to him, blow all the competition away, and it isn't even on the market yet or will be in the foreseeable future! Around here, I call those types Drama Queens. Bob, that's funny! Maybe he's a fire hazard, too? Post #71 in that thread made it well worth the read. All I can say is that was absolutely brilliant! In other "he's at it again" audio news and the talk about AV123 in that thread, MS has been recently charged with 14 felony counts. You're right, post #71 was awesome. I skipped the rest of the thread thanks to Onn's warning of wasted time. In some parts of that country, you can be legally murdered by your family for those behaviors.